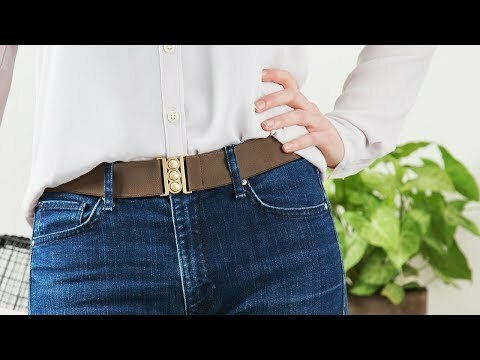 Unbelt is a women’s stretch belt that looks great, feels comfortable, and is easy to forget you have on. It’s so slim it lies flat, closing the gap between your waistband and you. The size is adjustable and you can actually stick it in the wash if it gets dirty. Whether you want to wear it incognito under a shirt or over a tunic, Unbelt will look (and feel) good. This belt is awesome! It just works!! Besides making great-looking belts, the Unbelt company is committed to doing it in the best way possible. This certified B-Corp pays fair wages to its workers, and ensures safe working conditions for them. Maker Claire Theaker-Brown was living in Shanghai when she founded the company, so “Made in China” means something very different in her case. It wasn’t outsourcing when the women sewing the belts lived right down the street. Claire’s proximity to the supply chain for her materials resulted in a closer relationship with manufacturers and a careful, meticulous attention to the details of this sleek (yet comfy!) design.